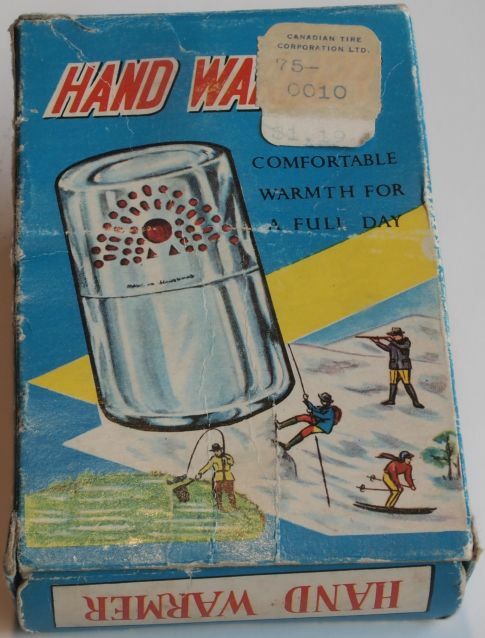 Can you guess what year this Hand Warmer sold in Canadian Tire for $1.19? Back in the days when horses still delivered the milk, my one friend Ron bought this himself when he got a job as a teen in Northern Ontario (Ron is seen in some of the first videos). He showed up with this, and, dismayed when he found it had a new dent he had not seen before, asked me if he should rethink taking it to Antiques Road Show. After a few beers Ron offered to sell it to me for only $700.00, but we we eventually decided I should just rebuild it. After a few more beers, I did, and that was his Christmas present. Ron reports that the new carbon felt and catalyst, along with the deodorizer, has it working better than new, and he no longer wishes to sell it at any price. In March of 2017 we got the results of testing that was done on the new catalyst pads that we pulled from various Chinese handwarmer heads. The results showed that the catalyst material used is Palladium mixed with Iron at a density of .5-.8% by weight. The use of Palladium and Iron allows the pads to be made for much cheaper cost than the USA made platinum catalyst that is loaded on the saffil substrate at 1% concentration. Palladium has a lower melting point than Platinum. In addition, Platinum is less susceptible to contaminant poisoning, and these two factors should increase the service life of the handwarmer heads that are based on Platinum rather than Palladium. New for winter 2016-2017, Carbon felt and catalyst rebuild kits. When we placed some of the new catalyst material into a hand warmer head, and used about 3x as much as was previously packed into the head, it was too hot to touch unless oxygen restricted in a carry pouch. So it would seem, real platinum catalyst does make a difference, and you can fine tune your head to meet your individual needs. Oh.. BTW, I sometimes get asked why not the electric hand warmers? A: There are 10 million Joules in an ounce of fuel, there are 10 thousand Joules in a AA battery (that weighs .8 of an ounce). * Spot market prices at time of writing. For more on carbon felt see our carbon felt stoves page. It's amazing how little seat of the pants skills surround liquid fuel hand warmers and their proper use. We use liquid fuel hand warmers similar to the Zippo Hand Warmers every winter because the chemical hand warmers suffer from the same weaknesses as their liquid fuel grandparents (oxygen starvation), while not having the simple strength of more BTU's. Liquid fuel is not only better for warming hands. For example, they are also useful if you want to use a canister stove in winter. If you do not use an inverted stove with pre-heat tube, and keep your canister warm, you're not going to melt snow or cook, and the liquid fuel handwarmer can help. 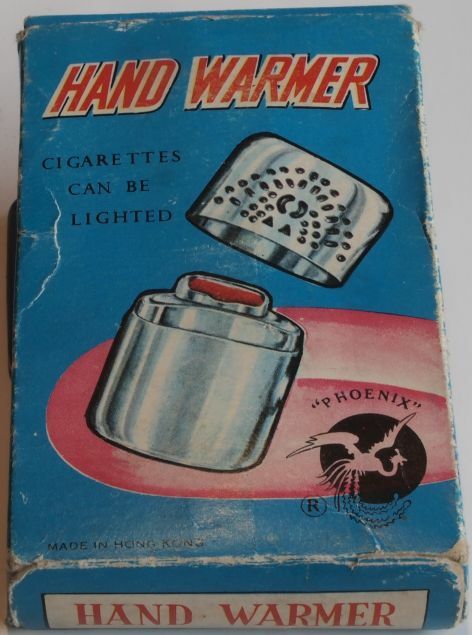 After using them for a few years, we suspected we could probably lessen our frustrations and improve upon Hakkin's 1923 hand warmer technology that has withstood the test of time by virtue of reincarnation as a 'Zippo'. So we started with the small Chinese catalytic hand warmers as having the greatest potential to address a variety of deployments for SAR Specialists and AT Skiers because they are inexpensive and mass produced. We looked at the potential to improve the ability of these to successfully warm hands, fuel canisters, and preventing water bottles from freezing by lessening their weaknesses, and improving their quality. Note the burnt cotton in the picture. This is a common sight. You'll also see the same burn area pattern on the cotton batting that is used in hand warmer reservoirs in the video below. That burnt area presents an obstruction to the movement of the fuel vapors from the reservoir to the catalyst. So, the hand warmer catalyst is deprived, and performance suffers accordingly (which is why this bear lost his paws to frost bite). Apart from performance, safety concerns regarding the potential of flammable cotton material to catch you unawares when you have no wieners or marshmallows, and become your next unintended campfire, can be improved upon these days as well. Additional benefits are seen with regards to wicking, odor filtering, absorption ability, weight, and heat resistance. All of this is possible by adopting newer space age synthetic material blends, such as those based on Mesophase Pitch or Polyacrylonitrile fibers. We have found a viable source of carbon felt to use for reservoir material replacement, and have started to replace the cotton batting in the Chinese hand warmers with a laminar insertion of tri folded carbon fiber batting material made from 90% Polyacrylonitrile and 10% petroleum pitch. The result is a noticeable improvement in hand warmer performance: the units burn up to 25% hotter, and last longer because they absorb and retain more fuel. 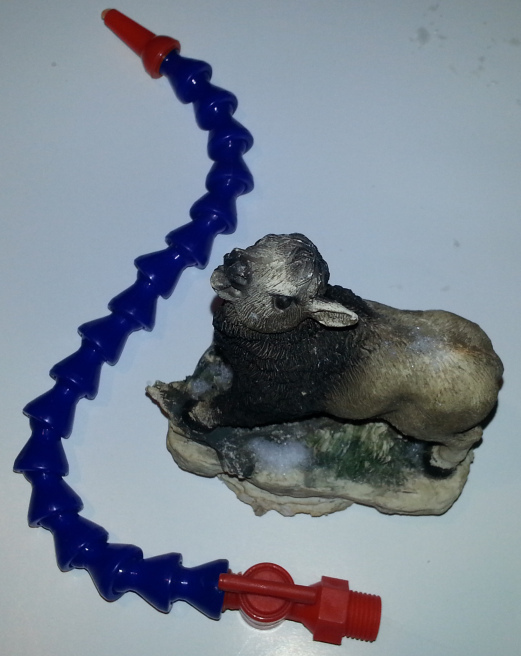 Another plus: the ability to use cheaper naphtha gas instead of Ronson fuel because the carbon felt is a better wick. And a big plus: odor emission characteristics. As you know, carbon is commonly used as a filter material. While the hand warmers are still not odor free, there is a significant improvement in the smell the hand warmer that uses carbon felt emanates as compared to the cotton filled hand warmers. Add a few drops of deodorizer to standard coleman camping fuel, and the unit is then virtually odor free. There is one important principle about understanding how hand warmers work that will greatly help in using them properly and avoiding damaging them. 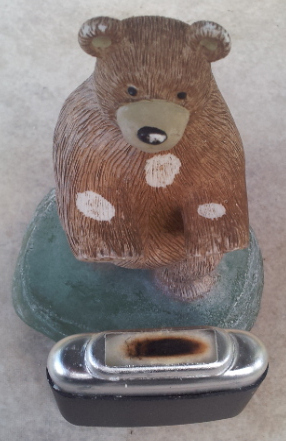 The misconception is that the hand warmer is 'burning' the fuel vapor. It does nothing of the sort. The platinum that is embedded in the head of the hand warmer acts as a catalyst to convert the vapor that is coming out of the reservoir into formaldehyde. The oxidization reaction that results creates a lot of heat. Jeff Hanna, one of North America's pre-eminent wilderness fly fishing guides, told us that hand warmers are much easier to start if the unit is pre warmed with a hot air gun. We tried, and discovered why he is one of the best in the business: he was right on the mark. So that is why when we are in the field and cannot find a current bush to plug our hair dryer into, we've started to prewarm the shoulders of the unit before trying to activate the catalyst. There is a video that sums up general properties of the Chinese handwarmers in general here. They are now making a version of the smaller hand warmer with more holes for better O2 combustion. 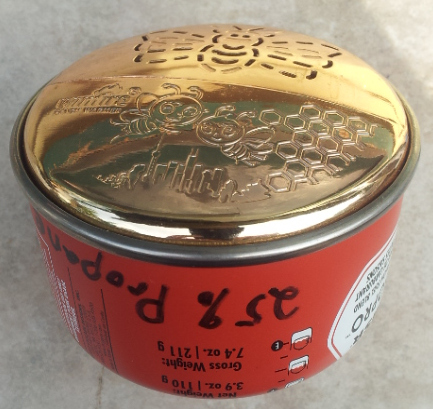 There is also a round one that fits the bottom of the smallest butane canisters perfectly. No Bluetooth, or Bluefinger. OK, so granted that due to lack of BT 4.0 connectivity, these probably will not appeal to consumers who must have the latest iPhone 6 with an HDR imaging chip in it. But each model of Hand Warmer is otherwise iPhone 6 compatible (with Android soon to come), and comes with one catalyst head, and the form factor suits a different purpose. If you want to warm your hands and canisters in very cold temperatures, get the round one. If you just want to warm hands (or iPhone) on long and cold days, use the Zippo copy. If you want to warm small spaces such as inside clothing, you are a gram weeny, and the temperatures are warmer than -10, then the small one may suffice for both hands and canisters. Ideally, each person would have 2 snorkels, and 2 of the small, and 2 of the larger, in their AT Ski Quiver. With full oxygenation and no ambient heat loss factors, you can expect the surface temperature of these hand warmers to typically reach just over 50C for the small units and 45C for the larger ones when the outside temperature is around 0 (sitting inside on a counter with no conductive, convective, or radiative processes, we had one of the small ones burn for 6 hours on 30ml of fuel and reach 70C at one point! It quickly cooled to 40C when moved outside with about 0C ambient air temps). However holding them in a cold wind, or a pocket, or cold hands, will quickly lower the surface temperature typically by 10 - 20C or more due to either the strangulation of the oxygen supply, or the transfer of energy through conductive, convective, or radiative processes that you are facilitating by the way you are using it, or what you have it covered in. • To achieve filling your butane lighter with winter butane gas mix, use a canister fill adapter to refill your butane lighter with winter blend butane from your stove canisters and do not refill your lighter with standard n-butane. • Winter stove operation: Do not use for canister warming until you are familiar with all the safety precautions of rewarming and use of winter mix (butane/isobutane/propane) stove canisters. (While canisters should never be heated past 50C maximum, I draw the line below 40. As a rule of thumb remember this: at 40C items are uncomfortably hot to hold but you can do it, 50C is the point where items have progressed to the point where they have become too hot to hold in your hand). • Expect the hand warmer to go out subsequent to being placed into direct contact with a cold canister. Restart it, let it build some heat, then place on canister again. Repeat this process as necessary. This will warm the canister. Another technique is to use one of the neoprene canister cozies and enclose both hand warmer and canister in it in such as way that there is still oxygen available to the hand warmer by leaving it partially unzipped or making a snorkel from a large diameter straw (such as those available in Asian markets for bubble drinks), and there is a insulating layer between them such as a carbon felt pad (see right sidebar). 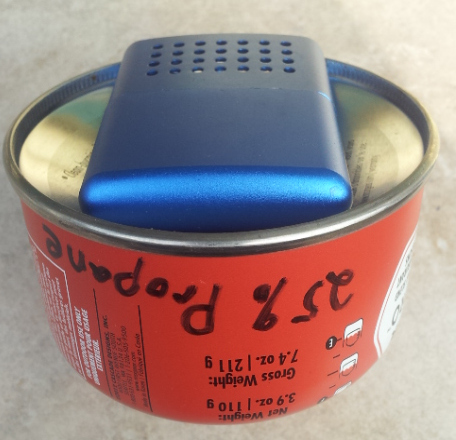 In this way the hand warmer can gradually heat the ambient air around the canister without experiencing a cold shock that will remove so much heat through conduction that it goes out. • If the hand warmer's top caps become loose and fall off easily, they can be tightened by squeezing them together in the middle until you achieve the desired tighter fit. An opinionated last word: each type of handwarmer has advantages and disadvantages. The con of the liquid fuel handwarmers is the scent of naphtha. fuel, and their temperamental nature of going out if cooled too rapidly. You can diminish some of the frustration by understanding how they work, which leads to facilitating your ability to keep them operating properly when you are in the field. 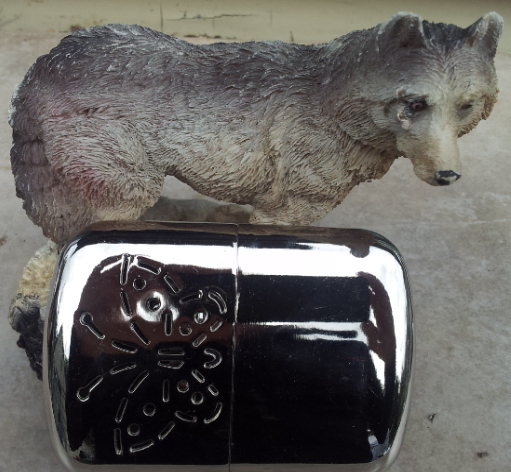 Another item that will also help a lot in this regard is a good lighter, so be sure to check out our lighters page. The biggest advantage of the liquid fuel handwarmers is their heat output, which is significantly more than the other types of warmers. This is why this style still is the preferred model for many in the mountaineering community. More Details on Order Form Items and mailing list subscription..
See order form for all accessories. *How many regular size handwarmers can the rebuilt kit do? - That depends on the type of rebuild. If you want to make a high performance rebuild, you can use all the felt and catalyst material for one rebuild. However if you just replace the same amount of catalyst as was in the origianl head, and you pack the carbon felt only into the top half of the reservoir (leaving the orignal cotton packing on the bottom half), then this will do two regular size handwarmers. If you want to rebuild the 6 hr handwarmers, there is enough carbon felt for 4 of them, but the catalyst requirement is the same. So if you wanted to rebuild 4 of the 6hr handwarmers, you'd need to order an extra catalyst pad. Hand Warmer, or “Pocket Warmer”? I was out skating on Bow Lake last year with some friends on a relatively calm and seasonal day. Rob’s wife Eleanor suffers from “Raynaud’s” which causes her hands to get very cold, even in relatively mild conditions. So I gave her some hand warmers in the hope it would alleviate her discomfort. It did not. She would tightly grasp the hand warmers with her bare hands, and they would go out. What’s the problem, cheap equipment? Not really. The reason most people experience problems with the hand warmers going out is due to ‘Cold Shock’. Hand warmers are dependent on an exothermic reaction to create heat. They do not ‘burn’ fuel. They are dependent of fuel evaporating so that the benzine fumes react with the platinum catalyst in the head. That’s why it’s best to warm the body of the device where the fuel reservoir is before you try to start the reaction in the head. Once the warmer is started, how well it works depends on how much fuel is turning into hydrocarbons (evaporating). If you cool the body of the warmer (IE: the fuel reservoir) below the point where evaporation cannot take place, the warmer goes out. So the trick to success with a Hand Warmer, is to make sure that what you are trying to warm, be it a hand or a fuel canister, is proximal to the warmer, and not in direct contact. That brings us to a more accurate descriptive term for these devices. They should be thought of as ‘Pocket Warmers’. To use effectively, carry the Warmer in a pocket that has sufficient oxygen to support the exothermic reaction (or it will suffocate). Place your hands in your pocket, but do not grasp the hand warmer in your hand. Although this method will take longer to warm your fingers and does not give you immediate gratification, it is a sustainable method that will keep you going. Always be sure to carry a lighter in your pocket in the event you do have to re-lite the Warmer anyway. Warming fuel canisters is more problematic. It the ice cold canister comes into contact it will extinguish the Warmer. However the heat that is transferred might be enough to get the canister’s pressure up to the point where it can start to work. The neoprene canister cozy’s are helpful for this procedure, and work best if you place a thin piece of ensolite pad between the warmer and the canister. Perhaps it’s better to refer to your Warmer from now on as a “Pocket Warmer”, as Hakukin does for their Peacock. As Rob told me when we were removing our skates, “happy wife, happy life”. To which I responded, “warm pockets, warm hands”. • Can I rebuild my own catalyst heads? - Yes, you remove the old material and replace it with an equal amount or more of the new material. The procedure can be seen in our videos.